OTTAWA - Health Canada is warning consumers who use Skin-Cap Spray to contact their doctor as soon as possible as the spray has been found to contain Betamethasone-21-butyrate-17-propionate, a prescription drug that could cause severe adverse reactions if used without medical supervision. It is important that individuals using Skin-Cap Spray get their doctor's help in finding an alternative treatment because if they suddenly stop using a potent corticosteroid, their condition could get worse or possibly become serious. Skin-Cap Spray has been approved in Canada as an anti dandruff preparation, but the product is mislabelled to treat seborrheic dermatitis and individuals may be using it to treat skin conditions for which it is not authorized. Skin-Cap Spray is manufactured in Europe and is being distributed across Canada by Dermalabs Inc., 1875 Leslie Street, Don Mills, Ontario. The product comes in a blue metal spray bottle with a white plastic lid contained within a small blue box with “Skin-Cap” encircled by a white oval appearing on two main panels and on one box end. All information is in black print. A recall has been voluntarily initiated by the firm following confirmation of the presence of Betamethasone-21-butyrate-17-propionate in the product. Health Canada is not aware of any reports of illness and has received no complaints associated with current distribution of this product. Distribution in Canada was only recommenced in mid-January 2000. 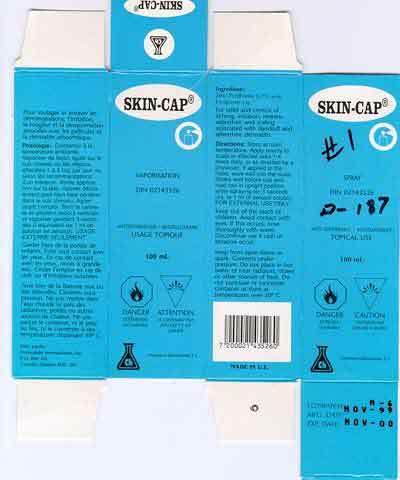 This is the second infraction for selling a Skin-Cap product which contains a potent corticosteroid (a media warning was previously issued by Health Canada on August 13, 1997, as a result of a recall when clobetasol was found in Skin-Cap products). Health Canada will monitor the effectiveness of the current recall. Steroid-containing products applied to the skin can cause thinning of the skin and dilation of tiny blood vessels, resulting in permanent scarring and secondary infections. In addition, using potent corticosteroids in large amounts or over a long period can cause more serious side effects, including: high blood pressure, diabetes, hairiness, acne, osteoporosis, weakening of bones, impaired wound healing, decreased resistance to infection, muscular wasting and behavioural changes such as mania and psychosis. More important, misuse of steriod-containing products can suppress the body's ability to produce its own corticosteroids which are needed to fight infection or deal with traumatic injury. These products should be used with caution on lesions close to the eye because they may cause increased intra-ocular pressure, glaucoma or cataracts. Children are at a greater risk than adults when treated with steroid-containing creams. Health Canada is issuing this warning to advise consumers, the Canadian Medical Association, the Canadian Dermatological Association, the Canadian Psoriasis Foundation, and the provincial ministries of health that this product has been analysed and found to contain an unauthorized and potent ingredient at a Class I hazard level.